The Hebrew Bible, or Old Testament, has economic laws which will rapidly, peacefully, and thoroughly end our captivity to Babylonian bankers. We are suffering due to a simple cause & effect relationship. One can ignore laws for gravity; but one cannot ignore the consequences of ignoring laws for gravity. Yah rules and has created economic laws. However, Man foolishly despises Yah’s laws out of vanity and pride. When humanity ignores Yah’s economic laws; we fall into debt slave captivity. The Bible refers to debt slaves as “bond servants”. Nearly every single problem that afflicts humanity is a consequence of rebellion to Yah’s law. Hate, division, poverty, endless war, addiction, Big Pharma, Big Oil, Big Agra, pollution, mass shootings, and political corruption are all symptoms. Our status as Bond Servants condemns us to Babylonian or Egyptian captivity. But now it’s time for an Uprising(music video)! Righteous Jew Nehemiah led a successful debt & usury abolition revolt. Read Nehemiah 5 to see how his people were enslaved by Money Lenders as we are today. The Tea Party, Occupy Wall St & Yellow Vest movements are motivated by common people against economic oppression. Taxes, usury, Money Lender usurpation are nothing new. History repeats and we need Biblical Debt Cancellation once again. First we must stop being divided and conquered by the Money Lenders. Mammon has unlimited funds to finance both sides of conflicts. Satanic agent provocateurs engineer conflict. “Order out of conflict” is their standard operating procedure. The Palestinian Conflict appears as if it’s impossible to solve. However, once the Money Power is defeated. Jerusalem will be restored as the city of peace. Star Trek “Day of the Dove” episode is an allegory. Which shows how a satanic, divisive, hidden power engineers conflict. How it’s power grows when we hate. How our negative energy is harnessed against us to enslave us in perpetual war. "Day of Dove" plan to heal Palestinian Conflict from Hour Money Jubilee on Vimeo. Walking the path, or The Way requires massive courage. 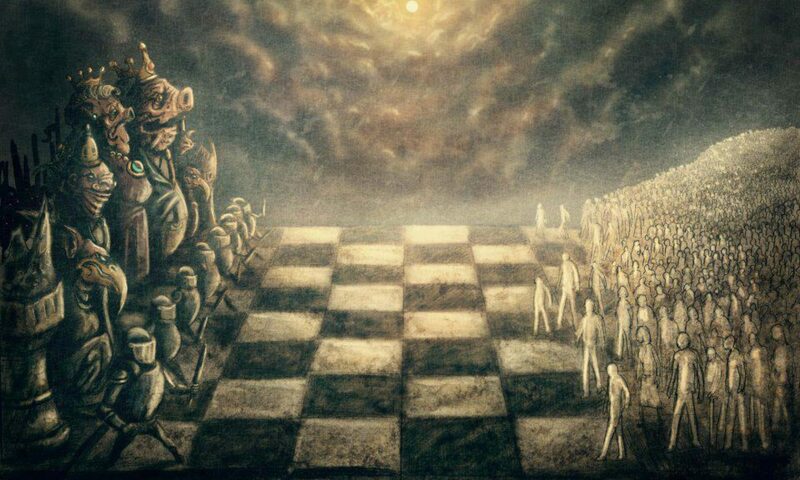 We are staring down Pharaoh’s armies which are charged with protecting the status quo. In order to overcome our fears. We must study and implement our own Hero’s Journey. A children’s book about the consequence of ignoring our dragons. The unchallenged Serpent from the Garden becomes the Serpent Dragon of Revelation. Serpents, vipers, snakes, nashek Snake Bite represent the Money Lenders. Nashek is Hebrew for snake bite and usury. “$” is the Brass Serpent on a pole from Numbers 21. The Serpent Dragon steals gold treasure & virgins. Our individual dragon vs our collective dragon. Problem: we all have been subjected to trauma-based mind control since birth. We must all commit to honest self-evaluation. We must re-align our values away from Babylon. Then toward Yah. Challenge: self-actualizing & peak experiences. Materialists’ fear of death creates their own prison. There is a collective Dragon ruling over us. Sadly, most deny their own Dragon & our common Dragon. Before the Matrix movie was Plato’s “Allegory of the Cave”. Each describing a false & real reality. And those who refuse to see the painful truth of our enslavement. Our corporate media is a banker scripted & financed false reality. Watch how corporate media warns about “fake news”. While they all read from the same sanitized script. “Operation Mockingbird” is a government, CIA program to social engineer and dumb down the population. “Rivers of Babylon” 2000 years of war on Yah’s Kingdom. Join our FB group and email list! Yah’s economic laws implemented by tribal Exodus judges of 10’s, 50’s, 100’s, 1000’s will quickly, peacefully, & musically end Babylonian captivity. We producers can self-issue money, forgive all debt & return First Nation status to all Tribes & Tongues. Yah’s law for authentic justice includes RESTITUTION of all land stolen. For example: Tribal Hawaiians have Hawaii returned to them. That’s the Good News of Jubilee! We intend to hire Babylon’s enforcers to work for Yah’s kingdom. Watch our music video for this vision. “The Chicken Note” video describes how common people issue money backed by their own labor & productivity. Monetary reformer Bill Still tests Hour Money local currency.